What In The World Was Michael Pineda Thinking?!?!? On April 10th, Michael Pineda made headlines for an apparent illegal substance on his throwing hand in his start against the Red Sox. Although it was seen by millions watching on TV, no action was taken by the Red Sox or the umpiring crew. Well, things changed quite a bit two weeks later. After struggling in the first inning, allowing two runs in the bottom of the first, Pineda figured he’d try something different. In the second inning, he took his place back on the mound, but with an obvious appearance change. John Farrell came out to ask the umpiring crew to inspect Pineda, after a thorough search of his glove, hands, jersey and neck, the crew chief clearly saw something he didn’t approve of. Pineda was thrown out of the ball game without any argument from himself or manager Joe Girardi. According to MLB rule 8.02, a pitcher may not use a “foreign substance” on the baseball. Violation of 8.02 is mandatory 10-game suspension, which means two starts. The substance was smeared on the right side of his neck, which wouldn’t be visible to the Red Sox dugout. Was that just a coincidence? Maybe, maybe not. I really don’t know what could have been going through Pineda’s head. After clearly getting away with it just two weeks ago, why risk it a second time around? When asked after the game regarding the substance Pineda responded “I did it by myself…Yeah, it was pine tar,” he said “I’ll learn from this mistake. This won’t happen again” Well, I’d say it’s a little too late to learn your lesson. As to why he put it on to begin with? “In the first inning, I could not feel the ball and I didn’t want to hit anybody, so I put it on.” Righttttt. The other part I don’t understand is how someone on the Yankees coaching staff or roster didn’t step in and say something. Girardi said after the game that neither he nor anyone else on the coaching staff was aware of the pine tar. Okay, whatever you say Joe. 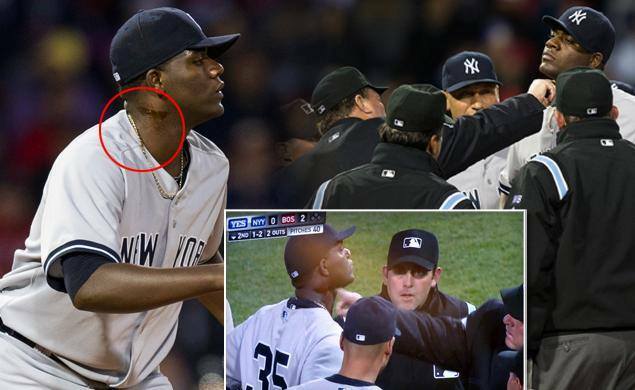 You can’t tell me that Pineda made his way out to the mound without a single person noticing his neck. Someone needed to step in and stop Pineda, since clearly he wasn’t smart enough to stop himself from making the same mistake twice. Broadcaster Michael Kay went as far as to question whether Girardi would be upset with Farrell for bringing this to the umpire’s attention to begin with. First off, I don’t think Farrell gives a damn whether Girardi would be upset with him or not, his job is to do what it takes to win games for the Red Sox, not worry about opposing managers feelings. Secondly, when Pineda makes a mockery of the rule and makes it so blatantly obvious, it would have looked worse for Farrell if he didn’t say something this time around. Although this rule is often overlooked, and many simply consider it just a part of the game, it is still against the rules. I find it hard to believe that someone hasn’t stepped in and warned Pineda about this since the April 10th incident. If anything, he should have at least put it on his hand again and acted as if he didn’t think that was a problem, because that’s where it was last time. By putting it on his neck, it makes people believe he was attempting to hide something. Pineda has been a bright spot for the Yankees early on. Before tonight, he has looked dominate in each of his starts and appears on his way to a comeback season. Now, he will surely be faced with a suspension and many will question whether his early success has been due in large part to his pine tar use. I like to think that isn’t the case, but only time will tell. Either way, on top of breaking the rules, Pineda deserves to be suspended for being this stupid. April 24, 2014 - 7:42 pm Suzyn W.